RCMP say they have arrested a naked and incoherent man after responding to a complaint of a cabin break-in on Galiano Island overnight. Police are alleging that he's the same man who leapt from a B.C. Ferry Wednesday night. RCMP got a frantic call from a woman reporting that a man had broken into her cabin and was throwing around furniture. The incident took place less than an hour after a man did a front-flip off a passing ferry into the frigid sea. "The male had no clothing on, was completely soaked, incoherent and not responding," said Sgt. Rod Pick, Outer Islands RCMP in a press release. The BC Ferries sailing Tsawwassen to Swartz Bay is usually non-stop — but everything ground to a halt when the man jumped off deck six on Wednesday night. Witness Jake Holm was enjoying the tranquil night sailing when suddenly a man flew past him into the dark sea. "I heard a loud noise like something breaking or cracking," said Holm, who looked up to see a life-raft flying down toward the water. "It was partially inflated, tumbling down the starboard side of the vessel," said Holm who leapt back to avoid the taut line as the ferry sailed fast through Active Pass. Then Holm heard a woman screaming "No! No!" "Then I heard a guy's voice yelling 'Yahoo!' sort of in celebration or something. Then I saw him, his body, just outside the window where I was standing. He had actually done a front-flip over the railing. It was a pretty impressive aerial manoeuvre and landed in the water." After that it was too dark to see if the man was safe. "We did have a man overboard situation," said Deborah Marshall, BC Ferries' director of media relations. "Customers witnessed a male in his mid-20s throw one of our rescue boats overboard and then he jumped overboard himself." "I assume he swam. He was not in the life-raft," added Marshall. 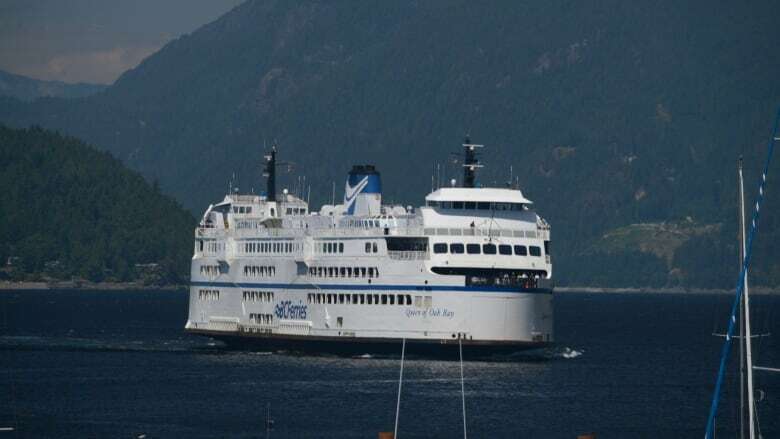 Passengers on the Coastal Celebration and the passing Spirit of British Columbia watched in shock as a man released a 100-person rescue boat, jumped overboard as the ferry passed Galiano Island, and headed to shore. "I am on the 9 p.m. ferry from Tsawwassen to Swartz Bay. A man was seen jumping overboard in Active Pass. The ferry stopped just outside the pass and launched a lifeboat and crew," Eloise Yaxley wrote in an email to CBC. Usually ferry-goers are squinting to try to see orcas or seals, but last night's voyage offered a different view. "RCMP are searching for him now. The ferry has recovered the lifeboat he launched overboard and the ferry will continue on to Swartz Bay," Yaxley later wrote. Police said they received several calls and emails from other passengers on the ferry. A search was launched for the mystery jumper, and BC Ferries said a resident of Galiano Island reported the suspected jumper turned up at somebody's home about 30 minutes after jumping from the ferry. Then he was later arrested at a resort. The ferry jumper was not the first passenger to do something like this. About a decade ago, someone jumped ship and headed to Mayne Island, Marshall said.